I have been growing tomatoes for almost 50 years. About five years ago, I received an invitation from a friend to see his tomato garden and it changed my outlook about growing the most popular plant found in home gardeners. I was very impressed by the vigor, size, and production of his heirloom variety called 'Daniels' which is said to be from West Virginia. This was one of the best-tasting tomatoes that I had ever eaten. He also generously shared some seeds with me and my choice of tomatoes to grow was changed forever. 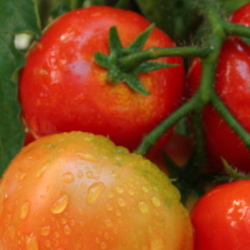 Scientists have been working for decades to perfect what they might call a perfect tomato. This is done by hybridizing, which is simply a means of crossing two or more plants by methods of pollination or tissue culturing. There are many reasons to try to improve on mother nature, including higher yields, ability to withstand shipping without damage, tough enough to withstand picking by mechanical devices, etc. All of this cross-breeding comes with a high cost: much of the flavor is sacrificed in order to reach their goals. That's where heirloom and open-pollinated tomato varieties enter the scene. In my humble opinion heirlooms taste better than 99.9 % of hybrid tomatoes. Many folks who are interested in growing heirlooms have asked me about certain terminology related to them. I will explain some of these terms for you. Pollination takes place by insects such as bees, wind, humans, or other natural means. Pollen is delivered naturally between plants by one of the means mentioned above. The advantage to this is that plants will adapt to local conditions over a number of years. Note: Tomatoes are self-pollinating, which means that they have both male and female parts. The most common definition is a plant that has been cultivated 50 years or longer and passed down from generation to generation. Seeds saved from OP or heirloom plants will produce fruits true to the parent from year to year unless a lot of cross pollination has occurred. All heirlooms are open pollinated, but not all OP plants are heirlooms. One of my favorite aspects of heirlooms is learning about the history of each variety. Such names as 'Mortgage Lifter', 'Radiator Charlie', 'Boxcar Willie', or 'Hillbilly' has to pique your curiosity on how the names came about. These are plants that have been crossed by human intervention, either through pollination or tissue culturing between two or more plants. As noted above this is done for a variety of reasons such as disease resistance, higher yields, or color. Seeds cannot be saved and replanted from hybrids. If you save and plant seeds from hybrids the result will be traits from one or both of the parents or maybe something altogether different. There are several other terms relating to growing tomatoes that I will share with you. Are plants that grow and produce all of their fruits at the same time. These are ideal for container growing. Once the fruits mature they are done for the season. These are recommended for canning and/or making sauces where you need a large amount of mature fruits at the same time. Some suggested determinate varieties Burbank Slicing, Rutgers, and Sophie's Choice. Are plants that grow mature and produce fruits all season long until something stops this, usually cold weather. These can grow quite large and need some type of support. Some Indeterminate varieties, Homers German Ox heart, Brandywine, and Cherokee Purple. Are plants that have been bred for their compact size, usually less than 4 feet tall. Despite their shorter statue they produce as many fruits as their big brothers. Some dwarfs include 'New Big Dwarf', 'Tasmanian Chocolate', and 'Dwarf Wild Fred'. 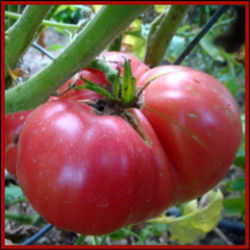 There are a number of places from which to obtain heirloom and OP seeds for tomatoes and other plants. Seed Savers Exchange is a non-profit organization which is working to educate the public and ensure that many heirloom varieties don't disappear. Sandhill Preservation Center is another excellent source for all types of OP and heirlooms. Last but not least Baker Creek Heirloom Seed is one of my favorite dealers for all types of heirloom varieties. I'm sure that there are many more sources out there; these are just some of my favorites. 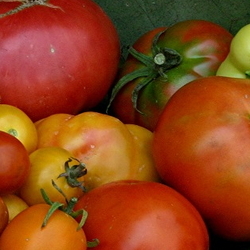 There are two more terms that you should know about when growing heirloom tomatoes. This is the type leaf that most folks are familiar with. The leaf margins are jagged or tooth like. The leaf margins are smooth and often are divided into several lobes. The leaf tissue on PL's is heavier or more leather like than RL plants. Some believe that the heavier leaf makes it more resistant to foliar disease, but I'm not sure that there is any research to support this. Last but not least I would like to pass along a method of preservation that I started last year. I grow about 30-35 varieties of tomatoes annually. I wash them peel and core the fruits. I then place them into freeze bags and freeze them. The trick is to mix different varieties together. The blend of different flavors is amazing from sweet to tart and everything in between. We use the frozen maters in soups and sauces. Give this a try; it's a lot quicker than canning, and the flavor is superb. Determinate vs Indeterminate and Other Tomato Quandaries Heirloom Tomatoes: Open Pollinated or Hybrid Limbaugh's Legacy: My Favorite Heirloom Tomato, "Potato Top"